January was a returned to some normalcy for world markets and Great Britain was much different with the exception of that whole Brexit thing. December wasn’t a good month until the end for Games Workshop, helped by some dividend love and promises of a good half year report. So under all that news here is how the stock performed for January. 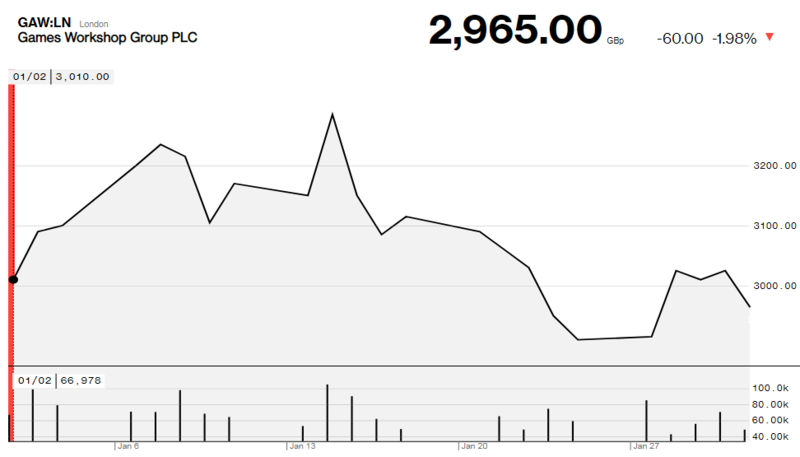 The stock is only slightly down to start 2019, with the stock getting a boost from a rosy enough half year report. As for that Half-Year report here is are the important takeaways. The topline should be Games Workshop is still pulling in record cash, but you can see a few yellow lights popping up, that shouldn’t be all too surprising. The first is Games Workshop is seeing growth in all markets, but one, Australia and New Zealand, The exchange rate and costs are really eating this sector alive and Games Workshop should really start to consider looking at cutting down some margins to get actual growth. The second is Forge World is down, having been seemingly rudderless for a few years now, this doesn’t come as any surprise with so many poor game decisions and lack of any real great releases. Black Library down too,seems like a bit of an anomaly especially with newish Audible access. Profits should though be back up as the Horus Heresy endtimes mass of releases will certainly bring in the dough. Games Workshop Online store sales is also flat, which could be related to online discounter competition since Game Workshop has relaxed it terms. The report also shows us where Games Workshop sees investment with what looks like improved automation in both Nottingham and Memphis. Royalty money continues to be the difference when it comes to profits rising a few million from last report as well. What do the financial papers though think of this report? For more details and other investment news check out the links below.